Don’t Miss Out on the FinovateSpring Very Early-Bird Ticket Discount! Hot on the heels on our largest FinovateEurope to date, we’ve begun to focus on our FinovateSpring event scheduled for May 12 & 13 in Silicon Valley. Our team is hard at work sorting through the huge stack of applications from innovative fintech companies looking to showcase their latest and greatest in front of more than 1,300 attendees. Based on the initial analysis, I think it is safe to say that this event is going to be one of our best! So, while it will be a few more days until we announce the presenter lineup, NOW is the time to lock in the affordable Very Early-Bird Ticket price. Buy your ticket before this Friday March 6th and you’ll save $200 on your chance to watch the future of fintech unfold live on stage! We’ll see you in Silicon Valley in May (or New York this fall)! FinovateSpring 2015 is sponsored by: The Bancorp, CapitalSource, Envestnet, Financial Technology Partners, Hudson Cook LLP, Kyriba and Life.SREDA. FinovateSpring 2015 is partners with: Aite, Bank Innovators Council, BankersHub, BayPay, Bobsguide, BreakingBanks, California Bankers Association, Canada, Celent, eBankingNews, Fin-tech.org, Filene Research Institute, Hotwire PR, Javelin Strategy, Mercator Advisory Group, Western Independent Bankers and SME Finance Forum. 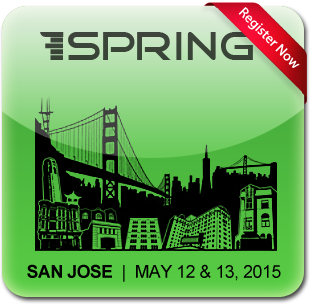 Apply to Demo Your Latest FinTech Innovation at FinovateSpring 2015! With the presenter roster set for FinovateEurope, we’ve begun our global search for the financial technology innovations that will be showcased at FinovateSpring in Silicon Valley on May 12 & 13. Last year, FinovateSpring welcomed a record crowd of 1,300 executives who witnessed 70+ new fintech innovations debut via our signature demo-only format. This year, based on the early interest, we expect the event to grow significantly and to showcase even more great innovations than last year. If your company is interested in debuting your latest and greatest at the premier event for fintech innovation, please email us at spring@finovate.com for more details. If you’re interested in attending FinovateSpring to watch the future of fintech unfold live on stage, tickets are on sale for the event at the affordable super early-bird price through this Friday only. We’ll see you in Silicon Valley in May (or London in a few weeks)! FinovateSpring 2015 is sponsored by: The Bancorp, CapitalSource, Envestnet, Financial Technology Partners, Hudson Cook LLP and Life.SREDA. FinovateSpring 2015 is partners with: Aite, Bank Innovators Council, BankersHub, Bobsguide, BreakingBanks, California Bankers Association, Canada, Celent, Fin-tech.org, Filene Research Institute, Hotwire PR, Javelin Strategy, Mercator Advisory Group and Western Independent Bankers. It was another stellar week in fintech fundings, simultaneously providing ammunition to those that think that private investments have peaked, while proving that it has not. The total included 2 Finovate alums: Bionym, which picked up $14 million and is scheduled to speak at FinDEVr next week and Taulia ($13 mil). Overall, the week saw 17 companies rack up a total of $242 million. For the month of September, a total of $770 million went into the sector (or about $600 million if you don’t classify Radius ($55 million) or Strategic Funding Source ($110 million) as fintech companies). That’s a $10 billion annual run rate. Thanks to the $35 million Series-G funding of Finovate alum, Ping Identity, the fintech sector managed to pull in more than $50 million for the week. The 17 recipients of new investor cash included two financial comparison sites, Hong Kong-based CompareAsia which covers a broad range of personal finance products across Asia and Brooklyn-based Zapari, which focuses on U.S. health insurance. 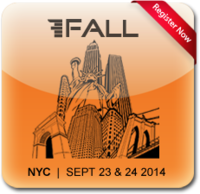 FinovateFall 2014 — Less than 50 tickets left! Don’t miss out! FinovateFall 2014 is next week and it’s official that the event will be the largest Finovate to date! Over 1,300 tickets have already been sold, and less than 50 remain! If you’re interested in seeing the future of fintech debut live on stage via our fast-paced demo-only format, please get your ticket as soon as possible to lock in your seat. We’ll see you in New York in September (or in San Francisco for FinDEVr)! FinDEVr 2014 Last Chance for Early-Bird Tickets! FinDEVr San Francisco 2014 — our first event focused on fintech developers — is less than three weeks away and we are getting very excited! After months of anticipation, we’ve announced the full presenter roster and action-packed two-day agenda. The show is going to be an incredible showcase of the tools, platforms and APIs that are being used to build the next generation of fintech innovation. Tickets are selling quickly ahead of the early-bird ticket deadline this Friday (register now to save) and we’re expecting a crowd of 400-500 innovators. If you and/or your technical colleagues are interested in attending to learn about the latest innovations for fintech builders, tickets are on sale at the early-bird discount of $100 off through Friday, September 12. Last Chance for FinovateFall 2014 Early-Bird Tickets! FinovateFall 2014 is just six weeks away and the buzz is building. After announcing the impressive roster of presenters a few weeks ago we’ve seen a substantial surge in ticket sales. Based on that surge, we’re now projecting a Finovate record audience of over 1,300 innovators, entrepreneurs, executives and investors! If you’re interested in attending to see the future of fintech debut live on stage, the last chance to get your ticket at the early-bird price expires this Friday. Last year, we sold out so please don’t delay if you want to guarantee your ability to attend the event.